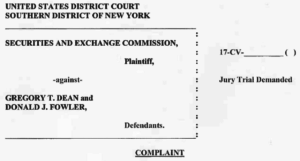 The SEC charged two New York stock brokers with churning client accounts. In the SEC’s court Complaint, it alleged that the two stock brokers used what is called an “in-and-out” strategy to produce large commissions for themselves at their customers’ expense. The Complaint charged Gregory T. Dean and Donald J. Fowler with embarking on a strategy for their clients that constituted churning. The churning strategy was unsuitable for the stock brokers’ clients. According to the SEC, the stock brokers engaged in the churning solely to generate larger commission profits for themselves and their employer, J.D. Nicholas & Associates, Inc., a now-defunct broker-dealer based in Syosset, NY. Specifically, Dean and Fowler were alleged to have executed a high-frequency trading strategy for 27 customers without any reasonable basis to believe that the strategy was suitable for anyone. Securities were purchased for customers’ accounts and then sold within one to two weeks. The SEC asserted that, because of the excessive trading and cost structure, the stock brokers knew or should have known that their actions were destined to lose money for all of their customers’ accounts. This churning of customers’ accounts benefitted the two brokers and the brokerage firm, while the customers’ account balances eroded. This case marks another chapter in the SECʼs pursuit of brokers who deploy excessive trading as a strategy in customer accounts to enrich themselves at customers’ expense…. The allegations in our complaint are based on our examination of trading patterns across more than two dozen customer accounts, and this trading data shows that only the brokers stood to profit from this cost-laden in-and-out strategy. On the same day that the SEC’s Complaint was docketed, the SEC’s Office of Investor Education and Advocacy (OIEA) and its Broker-Dealer Task Force jointly issued an Investor Alert called “Excessive Trading at Investors’ Expense”. In the Alert, the SEC cited its court Complaint in the Dean and Fowler case as one example of SEC enforcement actions involving excessive trading. The Alert warned investors that “excessive trading can occur even if the overall account value increases. Also, remember that your account statements, trade confirmations, and online account do not disclose all fees”. However, the SEC has not made any public statement as to whether this case was itself an actual SEC whistleblower case. The SEC Office of the Whistleblower posts Notices of Covered Action (“NoCA”) for Commission actions where a final judgment or order results in monetary sanctions exceeding $1 million. The NoCA list does not disclose if a particular Enforcement action was brought as the result of an SEC whistleblower case, tip, complaint, or referral being filed with the Commission.